As our Book of Common Prayer provides structure for our liturgy, the VGEC bylaws give structure for day-to-day operation of the Vergers Guild of the Episcopal Church. Landmark work by our board of directors preceded the Guild’s adoption of major clarification in the VGEC bylaws. Outgoing board president, Margaret McLarty was instrumental in the bylaw amendment process and openly admits that she enjoys parliamentary process. She was joined by committee members David Jette, Kate Pendzuk, and William White. According to David Jette, Head Verger, Trinity Wall Street, "The bylaws committee has been working for many years to make small amendments to the overall document. This was by far the most fundamental change in the bylaws since our founding and the committee believes that this was a positive move to develop more effective and sustainable leadership in the VGEC." After months of work and reasonable discussion and debate at this Annual Meeting, we unanimously adopted the amended bylaws establishing a “Vestry Model” of board structure which gives us overlapping teams of board members in three-year terms. This organization design ensures that new board members have experienced fellow board members to help them get up-to-speed and retiring board members have opportunity to pass along the legacy of work underway to the incoming class. Inherent in the “Vestry Model” is the sincere invitation to all VGEC members to take responsibility for Guild operational function by serving on committees large and small. Twenty-five vergers of the Diocese of Tennessee stepped up to sponsor and conduct this year’s Nashville conference in truly grand style. If we can emulate their thorough planning, extensive backup processes and dedicated, warm-hearted love of their tasks, our Guild will continue to thrive in its service to the Church. Elected to the VGEC Board Class of 2016 were Barry Norris, Church of the Holy Spirit, Harleysville, PA; Rich Lamlin, St. John's Episcopal Church, Essex, CT; and Richard Parker, Church of the Holy Comforter, Burlington, NC. Appointed to the Class of 2014 were Kate Pendzuk, Trinity Church, Ossining, NY; and Scott Smith, Christ Church Cathedral, Nashville, TN; with sitting member Pat Allen, Christ Church Cathedral, Lexington, KY. Appointed to the Class of 2015 was Cheryl Cantrall, All Saints Episcopal Church, Lakeland, FL with sitting members Duke DuTeil, National Cathedral, Washington, DC and William White, Christ Cathedral, Indianapolis, IN.These actions rounded out the 9-member board with three members in each class over three years. The Board met briefly on Saturday and elected its officers for the year: Scott Smith, President; Pat Allen, Vice President; Duke DuTeil, Treasurer; William White, Secretary. Margaret McLarty became Immediate Past President while the Rev. Matthew Corkern was appointed Chaplain, both non-voting ex-oficio board members. In his remarks at the Saturday evening dinner, Scott welcomed the new board and urged us all to live into our motto, “Service through worship and worship through service.” He said that the part of the Vestry Model which discourages long-standing committees of the whole in favor of dynamic and distributed leadership responsibilities is key to our managing continued Guild growth moving forward. Scott's invitation is clear - If you have a special skill or talent looking for an outlet, or if you excel in “getting things done,” step up and be a part of one of our several supporting task-oriented committees. Contact [email protected] if you have an interest in serving! A new Training Course (TC) Virge will be awarded to those who complete the VGEC Training Course beginning with the class of 2013 during the 25th Anniversary Conference in Nashville. The new TC Virge will also available for purchase by those who completed the VGEC Training Course prior to 2013. From concept to first award, the TC Virge has an established VGEC process of development, prototype evaluation and final design selection. The guild’s “Basic Virge” went through 20 or so designs and three board meetings in 2011 prior to its final design approval, manufacture and introduction. The objectives for the first guild-produced virge were low price, simple design, and well-defined specifications which could be executed by any commercial wood working business. The guild felt that this path would encourage new vergers to obtain a quality virge more quickly and more economically than having to make one on their own. For those who had the wood working skills and access to machinery, a Virge Finial Kit was made available separately. Finally, the board expressly aimed to not compete with the many fine commercial virges available from our traditional liturgical suppliers. In 2012 the VGEC Board started working on developing a distinctive new virge to be awarded to graduates of the VGEC Training Course. Scott Smith and Bill Gleason contacted Jeff and Kent Liddle of Liddle Creative Construction in Smyrna, TN after the previous virge craftsman said that he felt that he could no longer make the Training Course Virge for the guild. The Liddle brothers reputation for creativity in wood working is well established by their elegant cabinetry found in scores of up-scale homes in the greater Nashville area. You can also find their excellent work in the initial remodel of the sacristry, and the current upgrade of the vesting room at Christ Church Cathedral, Nashville. Jeff made up several design examples for board consideration. Bill Gleason recalls that, upon receiving the examples, “We dropped our jaws when we saw and handled the spiral virge prototype. I love the spiraling down as it drops through the hand.” The board approved the new spiral design during the 2012 VGEC Conference in Lakeland, Florida and Liddle worked on three variations on the spiral theme with incremental improvements. 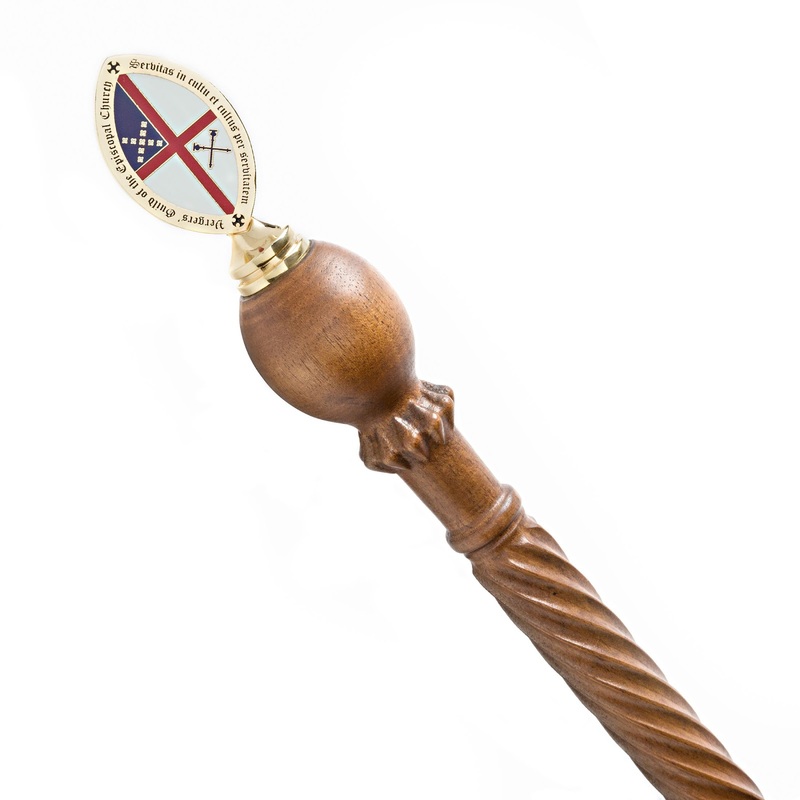 The new finial, a good looking double-sided VEGC seal, tops the spiral-turned mahogany 37-inch long staff. The length of the finished virge is 39 inches. The VGEC would also like to express gratitude to the Rev. Ernest Saik who over the past thirteen years designed, hewed, built, and shipped the original TC Virges to the the Guild each year. He made over 250 virges for the VGEC since the first virges were awarded in 1999 at the 10th Annual VGEC Conference in Jackson, Mississippi. These were awarded to the first recipients: Dianne Betts, Toby Griffen, and James Boyd, MD. The new TC Virge, priced at $175.00, will be manufactured once yearly to supply the VGEC Training Course graduates for that year, plus a small number set aside for purchase by earlier TC Course graduates. Contact [email protected] for more information or visit shop.vergers.org.